Located on the sands of Yas Island, Yas Beach has decided to take the Abu Dhabi beach scene up to the next level. 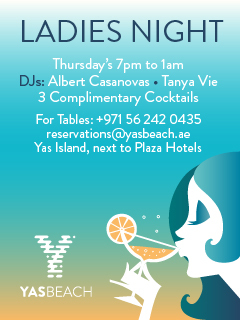 Yas Beach Club offers an unparalleled range of fun in the sun and has something for everyone. The new beach lounge area features an open-air DJ booth, complete with its own ellipsoidal bar, an infinity pool, and five private chalets. Around the pool, you will find Pool Cabanas you can get comfortable in. The tropical themed Tikki Bar and restaurant will ensure you to have one of the best food experience from the capital. On Fridays the infinity pool can be accessed only by adults (21+). We will make sure you gonna have a great pool party with good music and nice, cold beverages. LUCENZO & FRIENDS LIVE IN CONCERT!! Caribbean Beach Festival is back at Yas Beach in October, featuring international rapper Fat Joe. Free bus transport from NYU Campus to Yas Beach. Welcome to UAE’s Most Alternative and Unique Non-Stop Music & Art Festival – SoundOpia Yas Island Full Moon Festival March 1-2. Boogie Box returns September 7th, with another international booking. 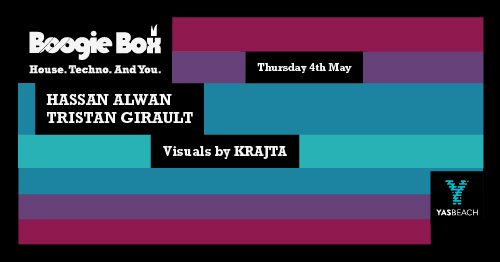 Boogie Box invite back Yafèi to take control of warm up duties, setting the groove for the night. And hand it off to Boogie Box main man Hassan Alwan for closing.